My family likes to take day trips, and I wanted to share this unique destination with you! Ephrata Cloister, founded in 1732, was a protestant monastic community of celibate Brothers and Sisters supported by a married congregation who lived near the settlement. Members, mostly German immigrants, sought spiritual goals rather than earthly rewards and chose Saturday as their main day of worship. At its zenith in the 1740s and 1750s, the congregation numbered nearly 300 people. Housed in impressive Germanic-style buildings, the lifestyle of the celibate members was characterized by strict discipline and self-denial. 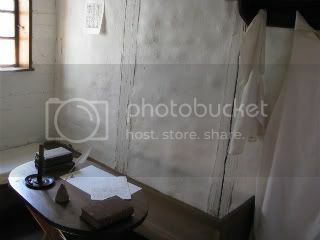 They became known for their self-composed music, Germanic calligraphy called Frakturschriften, and printing. Following the death of the last celibate member in 1813, the remaining married congregation formed the German Seventh Day Baptist Church. Members continued to live and worship at the Cloister until 1934. In 1941 the Commonwealth of Pennsylvania acquired the surviving elements of the historic site and began a program of restoration and interpretation. Today, nine original buildings are part of a 28-acre complex open for visitors. Visitors take a guided tour through three large buildings, then see the rest of the site at their own pace. I thought the history was very, very interesting, so I'll try to give you a bit of it here. The photo above depicts the Saron, the house in which the Sisters lived; the attached building on the right is the Saal, the Sisters' meetinghouse. If it seems as though the design seems somewhat haphazard, that may be because these structures weren't built to last. Because the people who lived here believed that Christ would return at any moment, they viewed worldly things as very temporary. However, it's interesting to note that a multi-story structure on the edge of Pennsylvania’s early frontier--when most people were living in log cabins--would have been quite impressive. The buildings in which the Brothers lived are no longer standing, but this will give you an idea of the living conditions. Each Sister had her own room, although the rooms are quite small. The benches run along two walls, and one of them served as a bed. There was no bedding, and a block of pine wood was used as a pillow. When our tour guide started talking about the daily schedule, I thought it sounded pretty good. They woke at 5:00am, prayed for an hour, then went to work. The daylight hours were filled with hours of work interspersed with hours of prayer. Dinner (vegetables, bread, and water) was at 6:00, and was followed by choir rehearsal or lessons in calligraphy. Bedtime was 9:00, but members were awakened at midnight for a two-hour church service; after that they were allowed to sleep for three more hours. I don't think I'd last very long under those conditions! While we were inside the Sisters' meetinghouse, our tour guide played recorded music that was composed at Ephrata during the 18th century. (Listen to an audio sample here.) 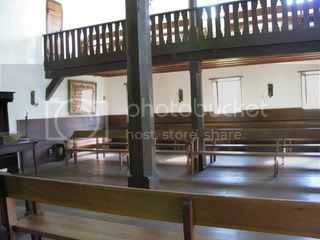 This seat, which would have been used by the preacher, was (if I remember correctly) relocated from another meetinghouse on the property. Finally, although the rooms are sparsely decorated, I liked these wall fixtures enough to photograph them. The photo on the left also shows the log-and-mud construction of the buildings; in most places that has been concealed under the white walls. I neglected to take a picture of the display that showed the white robes that the Brothers and Sisters wore. 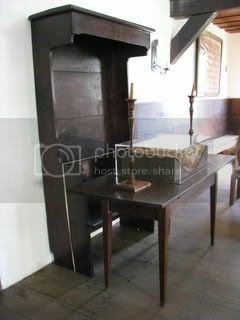 But at the official website, you can see photos and learn much more about Ephrata Cloister. I always figured that old buildings were built to last, not in this case when you say it wasn't important because the people believed that Christ would return at any moment for them. That is very interesting. I have never been to Lancaster co. but we were affilited with a church in Ephrata - Charity Ministries. I'm off to listen to the music. What a cool look around! Bathroom in own room yup that looked like a real deal closer. This so reminds me of home. I vaguely recall visiting here when I was a child. Nice post, thanks for sharing it.